Usha Raman is a very popular Henna artist in Auckland. She is also an experienced beauty therapist. Usha was the first person to introduce Henna Body Art in New Zealand way back in 1997. A couple of years after this she introduced it in Australia. Since then she has painted these temporary tattoos on thousands of satisfied and happy clients' hands, feet and bodies. 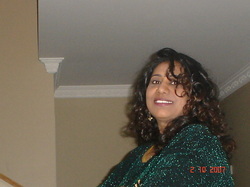 Usha loves working to please her clients and has a very friendly attitude. Usha is able to custom design henna tattoos for you or, if you want you can bring in designs of your choice. Lucy Lawless (Xena Warrior Princess).